Plauged by insane nightmare visions, Walter Gilman seeks help in Miskatonic University’s infamous library of forbidden books, where, in the pages of Abdul Alhazred’s dreaded Necronomicon, he finds terrible hints that seem to connect his own studies in advanced mathematics with the fantastic legends of elder magic. “The Dreams in the Witch House,” gathered together here with more than twenty tales of terror, exemplifies H.P. 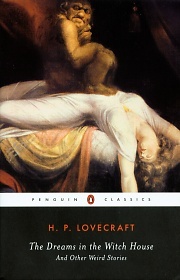 Lovecraft’s primacy among twentieth-century American horror writers. A companion volume to The Call of Cthulhu and The Thing on the Doorstep, this original Penguin Classics collection presents the definitive texts of the work, including a newly restored text of “The Shadow out of Time,” along with S.T. Joshi’s invaluable Introduction and Notes. The Dreams in the Witch House and Other Weird Stories. By H.P. Lovecraft, Edited with an Introduction and Notes by S.T. Joshi. New York, NY: Penguin USA; 2004; ISBN 0-14-243795-6; Paperback.